Those wanting to get closer to their music and movies owe the HD 449 a listen. Using specially tuned acoustic transducers, the HD 449 reproduces clean, intimate sound waves directly into your ears for a lifelike sound that helps you rediscover your music all over again. The leatherette earpads block out ambient noise, allowing you to listen at a safer levels with a much greater attention to the enhanced detail this headphone provides. The included cable extension adds length on-demand for listening on-the-move or at home. Sennheiser’s HD 449 stands out from the crowd with its striking, kink design and high-quality audio reproduction. Delivering detailed sound and clarity, both indoor and outdoor with its advanced acoustic system, these headphones are guaranteed to please. 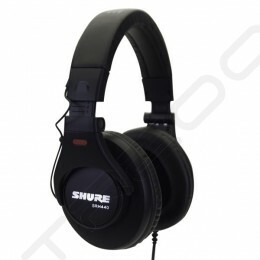 Its design ensures a comfortable fit around your ears and isolate against ambient noise. Completing the package are gold plated plugs, extension cable and adaptor for excellent connectivity anywhere.